A new field or attribute called msdyn_gdproptout (display name: GDPR Optout) is added to the Contact, Lead, and SystemUser entities when you enable the Dyanmics 365 AI for Sales features in your Dynamics 365 instance. The field lets you specify whether relationship analytics will be performed on the entity record's data. Setting the GDPR Optout field to "yes/true" will prohibit any relationship analytics to be performed on the entity record's data. Setting the GDPR Optout field to "no/false" will allow relationship analytics to be performed on the entity record's data. 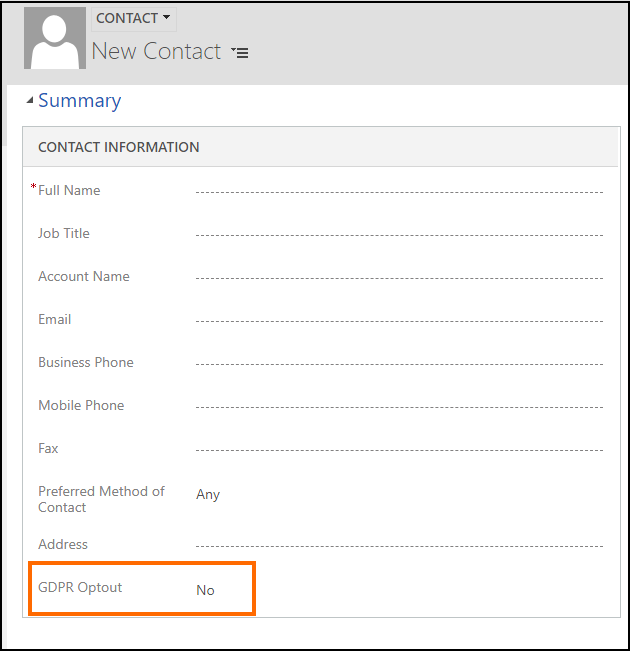 For the Auto Capture feature, if you set the GDPR Optout field to "yes/true" for a Contact or Lead record, email data for such records won't be displayed in the respective Contact or Lead forms, or any entity form which has these Contact/Lead records as their linked or related entity. This topic is applicable only for the Relationship Analytics and Auto Capture features. By default, the GDPR Optout field is not available on the Contact, Lead and SystemUser forms. You can customize the form to display the GDPR Optout field for these entities so that one can easily set an appropriate value in this field for a record. By default, the value is set to No (false) for this field when you create a new record. You can also programmatically set or update the value of the msdyn_gdproptout attribute by using Web API or Organization service. Web API: When you want to update only a single attribute value for an entity record, use a PUT request with the property name appended to the Uri of the entity. The following example demonstrates how to update the msdyn_gdproptout attribute value to true of a contact record with the contactid value as 00000000-0000-0000-0000-000000000001. Organization service: You can use the early or late bound programming style to update an attribute. The following example demonstrates how to update the msdyn_gdproptout attribute value to true for a contact record using late bound programming style. // Create a column set to define which attribute should be retrieved. // Retrieve the contact and its msdyn_gdproptout attribute. // Update the msdyn_gdproptout attribute value. // Update the contact record. For more examples of using the early or late bound programming style, see Use the early-bound entity classes for create, update, and delete and Use the Entity class for create, update and delete.